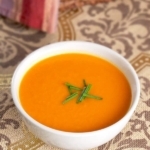 Get a vitamin boost with this vibrant tomato & sweet potato soup. 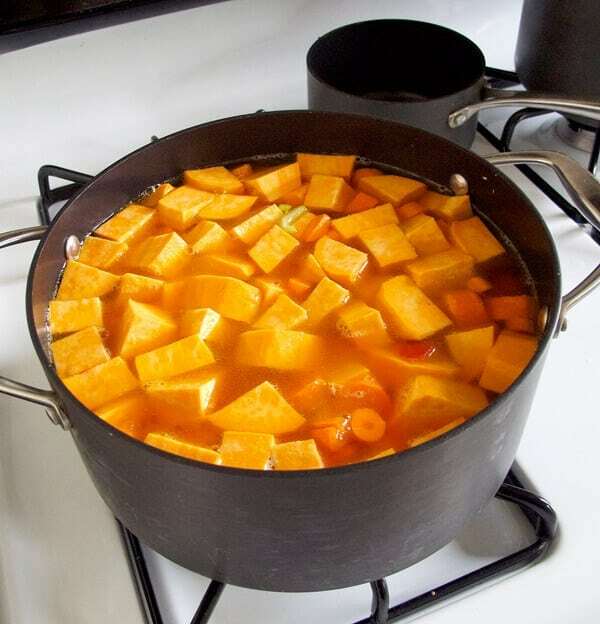 Adding lots of veggies, heat and broth to a sweet potato soup helps mask the natural sweetness of these colorful tubers. This is a perfect solution for those who like me, don’t really enjoy the taste of sweet potatoes, but still want to reap the health benefits. Extremely high in vitamin A, B and C, which help protect against free radicals (what causes skin damage), and also high in fiber and iron, they are considered as one of the healthiest vegetables to eat. So avoiding them would be a shame since they are so good for us! It’s only been a few months since I’ve been working with sweet potatoes and trying to tone down their sweetness in the dishes I create. It has been a bit of a challenge but I did come up with some recipes that are excellent and truly yummy! This new addition is pretty terrific too! 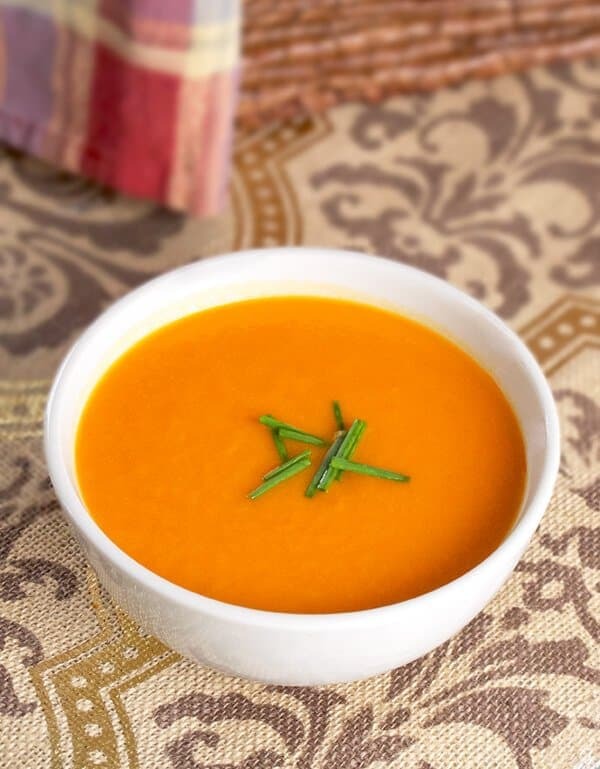 Spicy tomato and sweet potato soup – almost like spaghetti sauce! In fact, I might give that a go and try it with pasta next time! 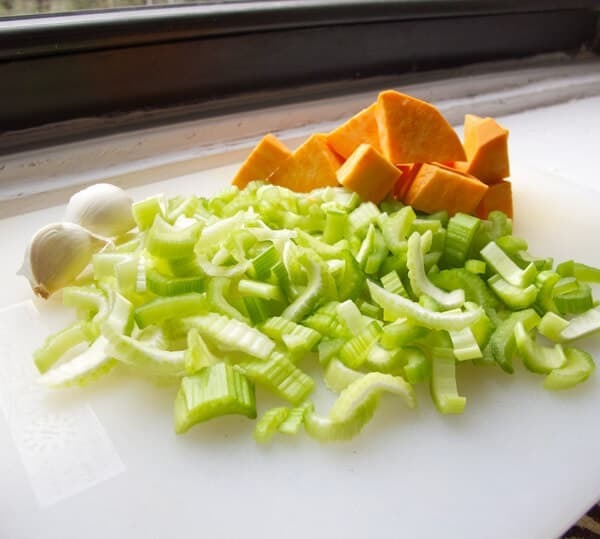 Celery is an excellent source of fiber and easy to add to any soups. 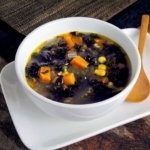 What’s wonderful about this soup is that there’s barely any oil in it (only 2 tbsp of extra virgin olive oil) and yet has a very creamy texture, thanks to the sweet potatoes. It also consists entirely of vegetables (except for the chicken broth, which you can easily substitute for veggie) and the cooking can be mostly left unattended. 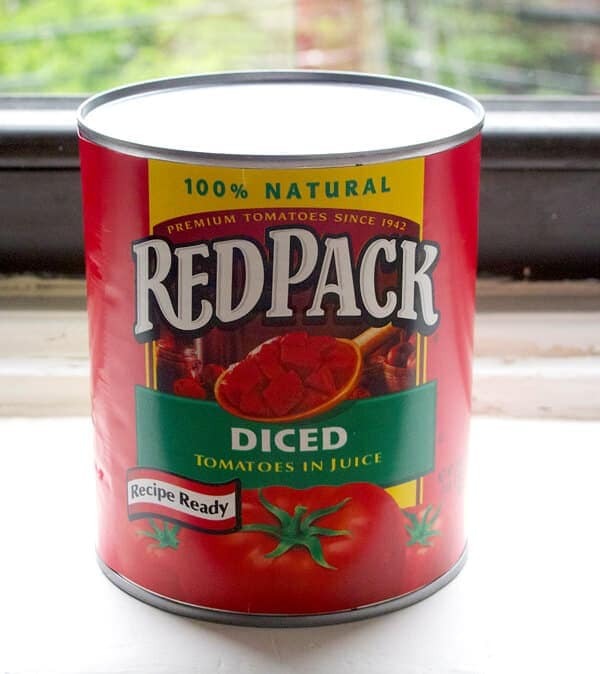 Tomatoes become more concentrated in lycopene the longer they cook. Because this spicy tomato and sweet potato soup has a lot vegetables in it, there’s some serious chopping involved. That’s when I turn on Netflix and play it in the background (usually a sitcom since I enjoy the sound of laughter) while I leisurely chop away. Cooking really is therapeutic when you know your way around a kitchen, and becomes fun! My kitchen is a lab where I create potions and elixirs to care for my body and health, but to also satisfy my taste buds desires! Plus I love watching my husband devour with gusto the food I cook, there’s nothing that makes me happier! Add enough broth to cover all the vegetables. A colorful and healthy spicy tomato and sweet potato soup packed with nutrients to make your skin glow. In a large pot over high heat, add olive oil, jalapeno, garlic, onions and celery. 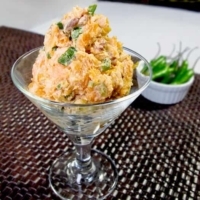 Cook for 5 minutes or until vegetables are soft but still yielding a crunch. 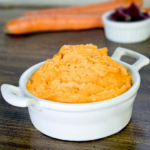 Add carrots, sweet potatoes and diced tomatoes. Cook for 2 minutes and add chicken broth (substitute vegetable broth for vegans). Add enough broth to cover the vegetables, make adjustments if you need to. Bring to boil, cover and simmer for 40 minutes. Turn the heat off and blend the soup in batches in a blender or use a hand mixer (immersion blender). Season with salt and pepper and serve.